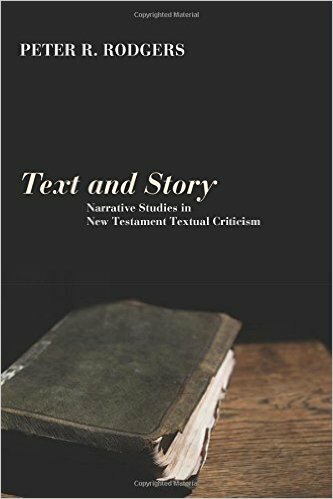 In a previous post Peter Rodgers announced the publication of his new book: Peter R. Rodgers, Text and Story: Narrative Studies in New Testament Textual Criticism (Eugene, OR: Pickwick, 2011). Although it is not a long book, it covers 10 passages and has loads of arguments, but I don’t have time for the extensive engagement of a long review (remember this is a blog). Anyway, the book is very readable (I only got it yesterday and have actually read the whole thing already), with an introduction, ten brief chapters, and a conclusion. It is only 106 pages of text. Clearly this means that it is not a full-on scholarly treatment of each passage and all the history and issues raised; that is no bad thing even if there aren’t enough footnotes for the enthusiast (note that he certainly references scholarship in English, French and German). In a nutshell Rodgers thinks that attention to the way in which various NT texts allude to or echo OT passages or broader scriptural stories can offer a new perspective on textual problems where external and internal evidence is indecisive. Hitherto, he argues, there has been ‘a clear tone-deafness to intertextuality and its possible bearing on text-critical issues’ (p. 10). A repeated theme/claim is that Christian scribes of the second and third century may have missed allusions that would have been obvious to Jewish(-Christian) authors and original readers (e.g. p. 42f, 53, 60, 70, 76, 83, 92). So many of his preferences are for readings where the external evidence is at least somewhat divided, where one of the readings exhibits evidence of allusive reference to an OT text or embedded story more than the other reading. An example of this is his take on Heb 2.9 where he prefers XWRIS QEOU (with Origen, loads of fathers, 1739 and some other support), because of the way in which the wording, shape and story of Psalm 22 informs the broader context of Hebrews 2 in such a way as fits with the reading XWRIS QEOU in 2.9 (pp. 31-43). He argues that ‘copyists who did not hear the echo of Ps 22:1 in 2:9 or recognize the importance of Psalm 22 for the early chapters of Hebrews would have failed to recognize the literary and theological value of the harder reading’ (p. 42f). It is interesting that Rodgers often (as in this example) finds common ground with B. Ehrman on the preferred reading, but not on the question of scribal motivation; he states in the conclusion that ‘the context of second temple Judaism is equally as fruitful as the Christological debates of the second and third centuries for explaining textual change’ (p. 105). Sometimes this takes Rodgers into what might be thought of as pretty wild territory. For example he argues for the reading WNEIDISAS ME in Mark 15.34 (on the basis of a combined allusion to Ps 22 and 69), but with only D and some Old Latin in support (pp. 44-53); in Phil 4.7 he prefers the text - ‘your hearts and your minds and your bodies’ - with support only from P16 (and then not completely - his reading is really somewhat conjectural) and some vulgate manuscripts, and the basis of a claimed echo of Is 26.3 (pp. 72-76). Here we see something of the radical eclectic, the disciple of Kilpatrick (Elliott also offers a supporting blurb on the back cover). At other points, somewhat similar arguments can support a reading already widely accepted: so the long text of Luke 22.43f (on the basis of allusions to Is 53 and Ps 22); the NA reading of Acts 20.28 (on the basis of a complex of echoes to Gen 22; Is 43 and Ps 74); the NA reading of Luke 3.22 (on the basis of a complex of echoes to Gen 22; Is 42 and Ps 2). In addition he argues for other readings, which while not adopted in NA have been argued before, e.g. reading QEOS in Rom 8.28; ‘and fasting’ in Mark 9.29; ‘me’ in Rom 8.2. The great thing about Rodgers’ approach is the integration of exegesis (broadly conceived, including the structures of thought and story underlying NT texts) with textual criticism. The pondering of OT allusions and echoes is very valuable, although the arguments for these allusions are not, in my humble opinion, universally persuasive. Nor indeed, are the allusions demonstrated in detail (Rodgers paints the broader picture of the themes and story of an OT text well, but doesn’t always pin the broader story to the details of the NT reading). Take Luke 22.43f as an example. He thinks that these words ‘would have been “heard” by their earliest readers as an echo of Isaiah 53, and of Psalm 22’ (p. 60). But this is defended only on the most general basis (Luke is interested in these texts; scholars have studied the relevance of these texts to NT writers, they appear in a list of 12 passages that have been thought to be reflected in this passage), never on the basis of the wording of the reading itself. Another example is Phil 4.7. Rodgers thinks that the original reading is ‘And the peace of God, which surpasses all understanding, will guard your hearts and your minds and your bodies in Christ Jesus.’ These three terms are ‘a conscious echo of Is 26.3’ (p. 75); but ‘the echo of Isaiah 26 was not of sufficient volume to copyists less attuned to intertextual echo than Paul and his readers’ (p. 76). But we might ask how load is this echo? [Is 26.3 RSV: ‘Thou dost keep him in perfect peace, whose mind is stayed on thee, because he trusts in thee.’] Rodgers thinks that ‘bodies’ are in view in Is 26.19 and throughout Philippians, but fails to show any real anchor for this echo in Phil 4.7. So the strength and clarity of the proposed allusion/echo remains an important issue for me in considering each of these cases. When the case for the allusion/echo is strong (say for Heb 2.9) this made the text-critical argument also strong, but reasonably often this was not the case (some friends would suggest that I am not strongly attuned to picking up quiet echoes). In summary I should say that of his ten examples I think I already agreed with three of them strongly and two of them mildly. Of the five others I was pleased to read the discussion and argument, and found one or two of them “interesting” (as opposed to convincing) and will certainly try to take these into account in the future, but couldn’t pronounce myself persuaded that he was right. I certainly take the point that some readings may exhibit original authorial intertextuality, but would like a more solid foundation for some of the claims. As a whole it is certainly a worthwhile ‘experiment in New Testament Textual Criticism’ (p. 101), an interesting contemporary example of a reasonably radical eclecticism (in the tradition of Kilpatrick and Elliott) in a spirit of loyalty to a high view of Scripture, and a reminder that the critical apparatus can hide interesting readings for which a good case can be made. PMH: "I know Tommy attempts the odd savage critique of my early work on this blog, but I'm a tall Australian and he is Swedish." Yes, it seemed best to start with the early work and proceed chronologically ;-). As for critique of early work, we should not forget the nice winter some years ago when this tall Australian finally came to Sweden; as he wrote here on the blog, "It was good to meet Tommy at last and to scare him a bit with my robust questioning of his thesis." Peter, I couldn't have said it better! And the other Peter did that in Sweden too back in 2006, I should add. He made it a treasured moment to remember.